The blurry figures are uprising! 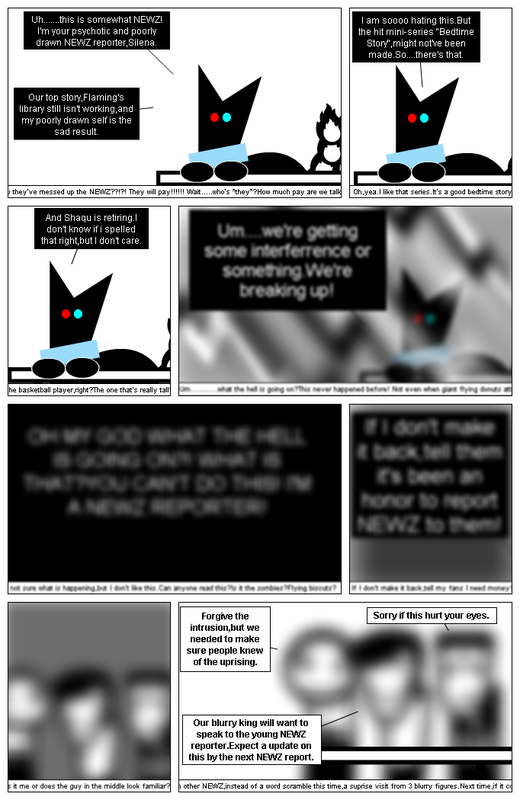 What will become of NEWZ naow? Uh.......this is somewhat NEWZ! I'm your psychotic and poorly drawn NEWZ reporter,Silena. Our top story,Flaming's library still isn't working,and my poorly drawn self is the sad result. Now they've messed up the NEWZ??!?! They will pay!!!!!! Wait.....who's *they*?How much pay are we talking? I am soooo hating this.But the hit mini-series "Bedtime Story",might not've been made.So....there's that. Oh,yea.I like that series.It's a good bedtime story. And Shaqu is retiring.I don't know if i spelled that right,but I don't care. He's the basketball player,right?The one that's really tall? Um....we're getting some interferrence or something.We're breaking up! Um............what the hell is going on?This never happened before! Not even when giant flying donuts attacked! OH MY GOD WHAT THE HELL IS GOING ON?! WHAT IS THAT?YOU CAN'T DO THIS! I'M A NEWZ REPORTER! I'm not sure what is happening,but I don't like this.Can anyone read this?Is it the zombies?Flying biscuts? If I don't make it back,tell them it's been an honor to report NEWZ to them! If I don't make it back,tell my fans I need money!!!!!!!!! Is it me or does the guy in the middle look familiar? Forgive the intrusion,but we needed to make sure people knew of the uprising. Sorry if this hurt your eyes. Our blurry king will want to speak to the young NEWZ reporter.Expect a update on this by the next NEWZ report. In other NEWZ,instead of a word scramble this time,a suprise visit from 3 blurry figures.Next time,if it comes. Who are these trouble peoples ? Nice one - hope you get your library back soon.